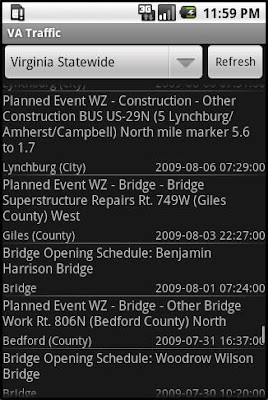 Ever been stuck in traffic, but the 511 voice prompts think that “The Midtown Tunnel” really means “Burke, Virginia”? Been there. 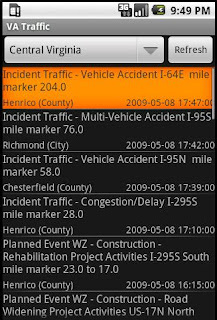 Now, as long as you’ve got a data connection, you can view all current 511 traffic alerts, by region. There’s two main screens to the app. 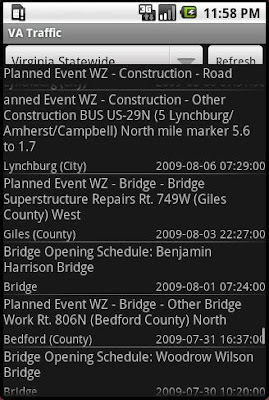 First, there’s the list of current alerts. Use the dropdown at the top to select your region. The refresh button is, I hope, self-explanatory. 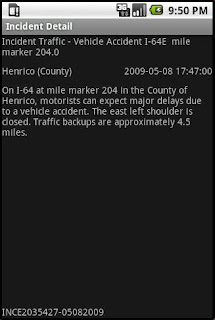 If you click on of the events, you can see all of the details on it, including a more detailed description, as provided by the 511virginia.org website. Hit your back button to return to the main screen. That’s all for now. It’s no-frills, text only. Here’s the link to download it.